Adding herbs to your diet is very beneficial for health. Almost Everybody wants to eat fresh herbs but it is also true that they are costly to buy from the supermarket. 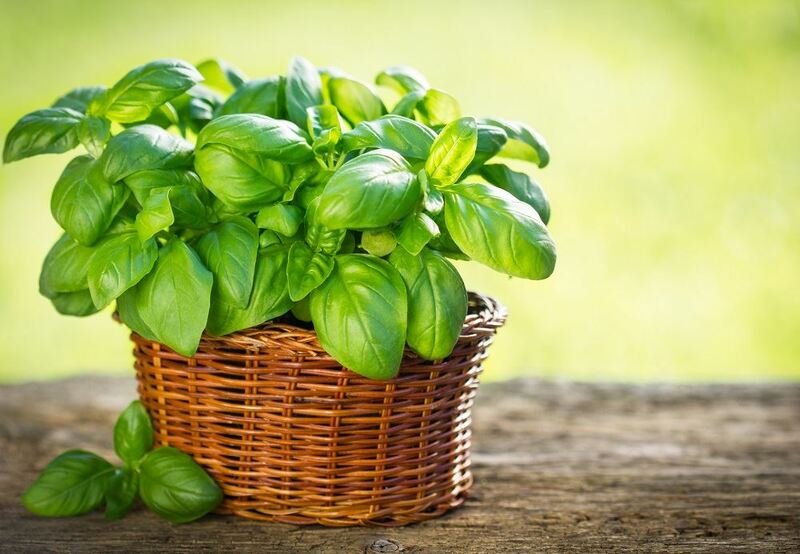 Nowadays growing herbs like basil at home are quite inexpensive and easy to grow. Herbs do not want much attention and care they grow on their own. Having a herb garden is an excellent way to save money and also reduce stress. Herbs can grow in short time period and you can harvest many times in a year. Basil is medicinal herb with thousands of health benefits. It has been using in medical industry nearly 5,000 years ago. Consuming raw basil or adding it into the food is completely safe you do not need doctors advise before consuming it. basil is one of the nature’s best gift to mankind. Years ago, when there were no medical college or hospitals ancient people use this herb to cure fever, common cold. The anti-bacterial and anti-viral properties make it suitable to use every day. It has no side effects. All age groups can consume basil (7 years to 100 years). The top most benefit of basil according to us is its immunity boosting properties. It is highly recommended to those having low immunity. This particular herb increases the immunity and make your body healthy and strong in few days. Long term use of basil is recommended by herbal doctors. People also use it to purify the blood. Today basil is the most important ingredient of top selling high quality face creams. There are more than 50 types of basil varieties are available you can grow any of them at any time of the year. Indoor growing gives you the power to grow seasonal herbs throughout the year. Every type of basil has its own taste. Choose your growing herb according to the taste or purpose of use. Below are the few types which are popular all over the world. Lemon Basil: If you like organic lemon tea then lemon basil is the perfect herb to grow. Moreover, it can also be used on salads as a side dressing. Cinnamon Basil: It is clear from the name it has an aroma and taste of cinnamon. Genovese basil: Mostly used in other recipes like making tomato-basil soups etc. if you like to have a cup of soup in afternoon than choosing Genovese basil is great idea. Basil is an herb which has hundreds of benefits which are not possible to cover in a single post. Researchers are still studying this amazing ingredient to find out more about it. a recent study suggests that basil consumption protect or cells but researchers are still studying how a small little herb can protect our body cells. Japanese people live long and healthy life than others in the world. In a research scientist have found that they slow down the oxidation process of their body which increases their life. Those works in radiology centers drink basil tea to protect themselves from harmful effects of radiation. According doctors everyone should consume a cup of basil tea every day. we also exposed to the radiation of different types the most common type of radiation that affects our health is the mobile waves. The mobile towers send signal waves and mobile devices also send and receive these waves. We all have mobile phone and keep them with our self-24 hours a day even at the time of sleep the mobile device sits near our bed. The antibacterial properties of basil are well known to whole world. In a lab test conducted in 2010 states that the basil oil helps young and old people to fight against bacterial infection. Ancient doctors recommend basil in various fungal infections. It is a natural antibiotic with no side effect and easy to consume on daily basis. It is very simple to grow and does not required much care and nutrition. Basil normally required 6 to 7 hours of sunlight. If you are growing it indoors than you have to give it quality light for at least 8 hours. It is not necessary to buy a grow light to grow it inside the house you can place it on the window self for 8 hours daily. You can use any type of container for it but make sure container is clean and free of bacteria before using it for potting basil. The plant normally goes up to the height of 2 feet tall. Does not require much space in fact it is easy to grow in small spaces of apartments. Generally, it does not need any specific types of nutrients. Growers use same nutrient formula for basil which they use for lettuce or other herbs. Potassium, calcium and nitrogen are the main nutrients that every plant need to grow faster and healthy. So as in the case of growing basil indoors. Which hydroponic systems is best suitable for basil production? For basil you can use any type of hydroponic systems. NFT is highly recommended for indoor growing basil. This technique of hydroponics uses less nutrients and is prefect for small root plants like lettuce and basil. 60 to 80 degrees is the ideal temperature range for basil. To check the current temperature of your grow room use temperature monitoring devices and adjust it according to plant needs. The way and time of harvesting basil all over the world is same. It does not matter when you grow basil harvest it regularly to get more form the plant. Once the plant has enough developed leaves pinch them and use according to your recipe. Some people use only leaves while others dry leaves and stems for later use. You can put the leaves of basil in your fridge for later use (not more than 3 days). Once you cut the basil leaves it will produce ore and more just after every cutting. Bonus Tip: once your plant reaches at the good height, to stop it from further growing (vertically). Pluck the growing tip of the plant this action will stop the vertical growth of plant but it will produce same amount of leaves. People like to grow basil from seeds but we can grow it form the cuttings. Actually growing basil form cutting is quite easy just wait for 7 to 10 days and you will see the new roots. Use of Rockwool is recommended to germinate basil seeds. The important step is we have to maintain the correct temperature for the germination. Take the basil seeds make a pen point hole into the Rockwool give some water and have patience for 10 days. Here we recommend rockwool and coco coir but you can use any growing material of your choice. Before using rockwool make sure their pH level is corrected to the ideal pH level for basil. © Shine Led. All rights reserved.